I recently picked up this â€œDead Insideâ€� hoodie from Valfreâ€™s black Friday sale and Iâ€™ve been living in it ever since. Itâ€™s so comfy and the perfect fit. Itâ€™s cropped but I got a size medium so that it had the cropped style but it was a little bit longer if that makes sense haha. Idk but I love it this way. I paired it with these awesome new Love Too True Trousers in the style â€œLydiaâ€�, which are on sale right now on Love Too Trueâ€™s website ðŸ–¤ Iâ€™m obsessed with Love Too Trueâ€™s clothesâ€¦ theyâ€™re such great quality and the trousers are super warm. Everything is also made to order so itâ€™s all ethically made!! I just thought the look would be super cute if I stayed with the whole yellow in black that was in the hoodie. 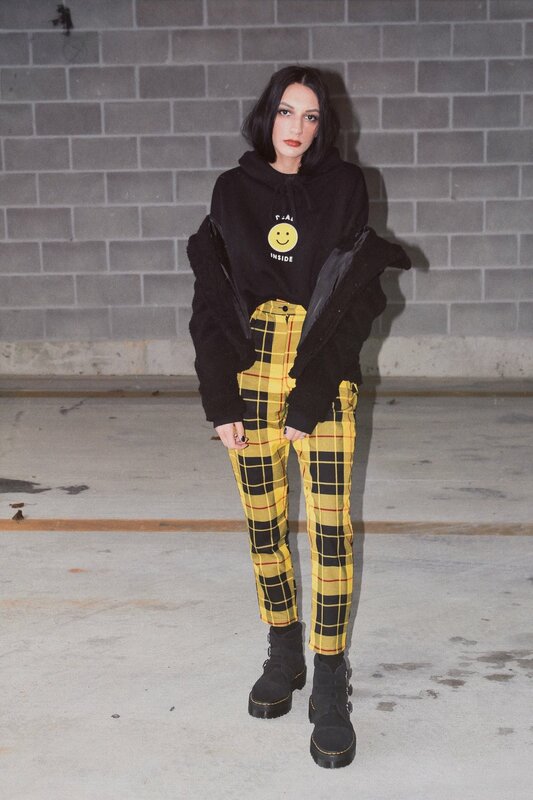 â€¦ And of course I threw on a pair of Doc Martens but these ones are the Lazy Oaf x Dr. Martens collaboration instead of my everyday Jadon Docs. :p I really liked the way this look turned outâ€¦ and I stayed pretty warm in this outfit too.